For every team, in every sport, there exists a dichotomy: what is expected of that team, and what that team actually becomes. The only exceptions are the super teams (think 1976 Cincinnati Reds, 1985 Chicago Bears, 2012-13 Miami Heat) or the extraordinarily dreadful (the 1992-93 Dallas Mavericks and the 2008 Detroit Lions come to mind). The mercurial nature of the 2013-14 Memphis Tigers made for a dichotomy as pronounced as any this proud program has experienced (suffered?) before. There’s the team Memphians wanted to see, the team they thought coach Josh Pastner had secured last November. A veteran (four senior guards!) core, a pair of prize recruits (Austin Nichols, Nick King), and a brand of athleticism that would ensure a frenetic offensive pace and stout, lock-down defense. And there were games this team did, in fact, surface. A payback win over 5th-ranked Oklahoma State in early December. An upset of 12th-ranked Louisville on the Cardinals’ floor in January. An astonishing late-game comeback against Gonzaga — with ESPN’s Game Day crew at FedExForum — in early February. 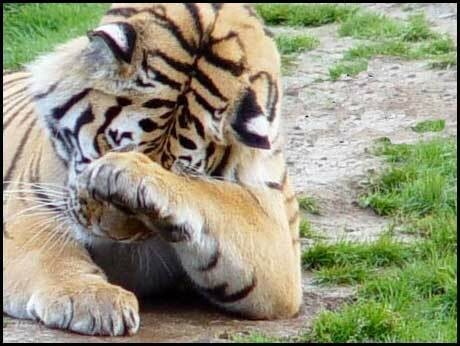 When the Tigers closed their second game against Louisville (this time ranked 7th in the country) on a 15-1 run, Tiger fans collectively screamed, Yes . . . this is our team! But hold on. The win over Oklahoma State was considered remarkable largely because the Cowboys had destroyed Memphis — scoring 101 points — less than two weeks earlier. As tough as the Tigers proved to be against the defending national champs, they were as soft in losing five games combined against Cincinnati and Connecticut. (You’d have to go back a few years to find a more dispiriting loss than the 19-point beat-down the Tigers took on their home floor against the Huskies in the quarterfinals of the American Athletic Conference tournament.) And let’s not forget the loss that may have done the most damage to the Tigers’ NCAA tournament seed: February 27th at Houston. A Cougar team the Tigers beat by 23 points in January controlled the game, start to finish. Mercurial doesn’t do this Memphis team justice. So what exactly was the group we’ll remember as the 2013-14 Tigers? Once the hurt of the season-ending loss to Virginia on Sunday begins to fade, when we’re able to pull back and examine the mosaic of a season instead of the tiny panels that made that season, we’ll likely see precisely what we got: One of the top 32 teams in the country, and no more. Next season will be very different. The departure of those four senior guards — Joe Jackson, Chris Crawford, Geron Johnson, and Michael Dixon — will alter, literally, the way the Tigers play the game. Tiger fans will have to get acquainted with Markel Crawford and Pookie Powell (both redshirted this season) and newcomers Dominic Magee and Avery Woodson. Big men Shaq Goodwin and Austin Nichols will become the faces of the program, while Nick King, presumably, transitions from role player off the bench to impact scorer. They will not be ranked among the country’s top ten teams, maybe not the top 20. And they will not be favored to win the AAC. They’ll enter the season claiming to be overlooked and under-appreciated, with little to lose and a new chapter in Tiger history to gain. And they’ll likely surprise us, for good or ill. They’ll win a game they shouldn’t . . . and lose a game they shouldn’t. Leaving those who love Tiger basketball to wrestle, once again, with the dichotomy that makes every season worth following in the first place. The ACC-champion Virginia Cavaliers — and lots of missed shots — indeed sucked the life out of the Memphis Tigers' 2013-14 season tonight in Raleigh. When the Tigers' Michael Dixon hit a three-pointer to give the Tigers a 14-13 lead midway through the first half, there was a sense the 8th-seeded team in black might be able to trade punches with the East region's top seed. It was the last three-pointer Memphis would make in the first half (and one of only three they hit on 13 attempts for the game). UVA proceeded to outscore the Tigers 22-6 the rest of the half, which proved merely prelude to a second half devoid of the drama that makes the NCAA basketball tournament so compelling year after year. Virginia won the game by 18 points despite taking five fewer shots than the Tigers. The Cavaliers shot 56 percent (30 for 54) compared with a horrid 41 percent (24 for 59) by Memphis. Virginia won the battle of the boards just as handily, with 40 rebounds to the Tigers' 28. Joe Harris led five Cavs in double figures with 16 points. Anthony Gill hit five of seven shots off the bench for 13 points, while ACC Player of the Year Malcolm Brogdon added 10 points and four assists. Freshman forward Austin Nichols led the Tigers with 15 points. 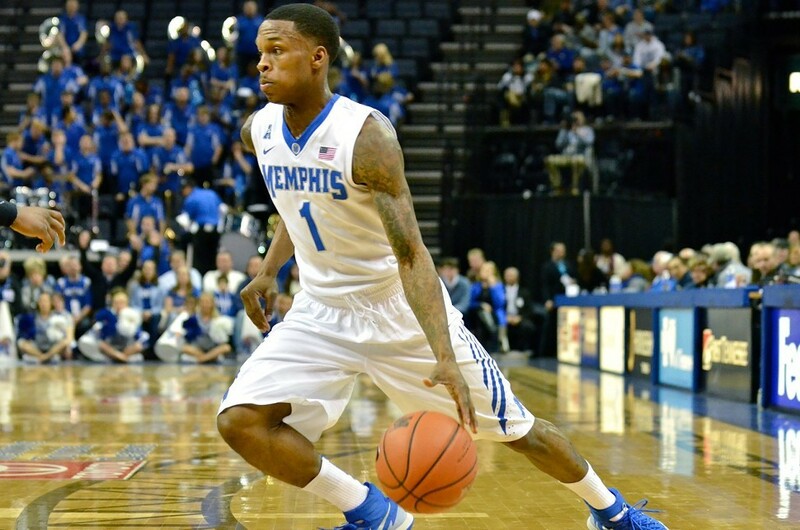 Senior guard Geron Johnson was the only other Memphis player with as many as ten (11). No Tiger had as many as seven rebounds or five assists. The Tigers finish the season with a record of 24-10, the first campaign short of 25 wins in high school or college for departing senior Joe Jackson. 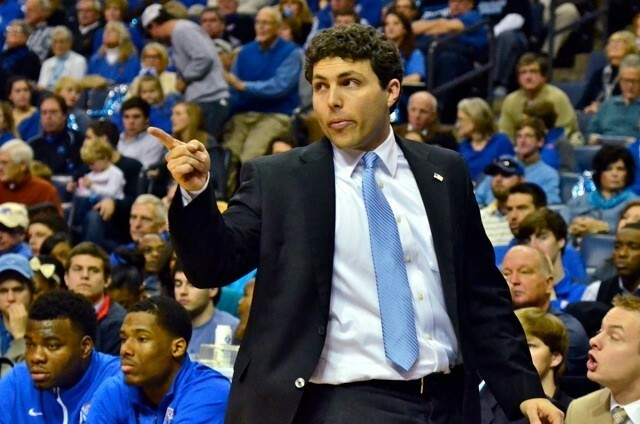 Concluding a season with extraordinary highs (two wins over Louisville) and extraordinary lows (the AAC tournament, tonight), the loss will surely raise questions about Tiger coach Josh Pastner's ability to turn talent into success . . . at least success as measured by deeper runs in the Big Dance. Tonight's blowout happened exactly a year after a 22-point loss to Michigan State ended the Tigers' 2012-13 season. Virginia improves to 30-6 on the season and will appear in its first Sweet 16 since 1995. UVA is the only team among six from the ACC to advance beyond the tournament's third round. The Cavaliers will face Michigan State next week in New York City. Check back Monday morning for analysis of the Tigers' 2013-14 season. Tiger senior Chris Crawford buried three three-pointers in the game's first eight minutes, as many as he'd hit in four previous NCAA tournament games. They were the only shots the Memphis native would hit, missing nine others but still scoring a career-high in tournament play (9 points). 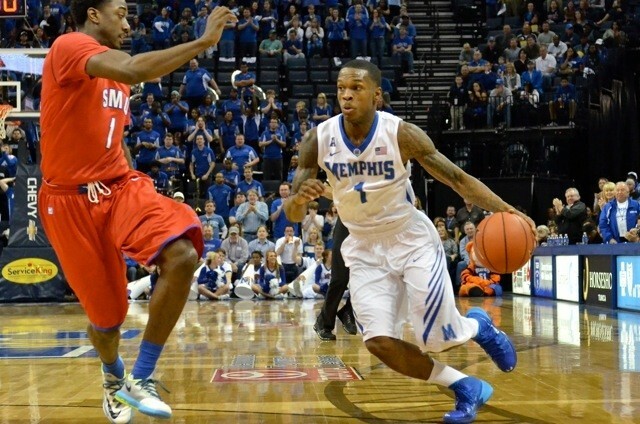 Fellow Memphian Joe Jackson scored 15 (also a tournament high) and contributed six assists to help the Tigers improve to 24-9 for the season. Dixon led Memphis with 19 points off the bench, including a trey with less than two minutes left that extended the Tigers' lead to 67-62. He also hit two critical free throws with 9.6 seconds left. Memphis led by 10 points with 9:30 to go, but steady play from the Colonials' Isaiah Armwood (21 points despite four fouls) and Kevin Larsen (16 points) kept GW in the contest. The outcome tests Tiger coach's Josh Pastner's oft-stated belief that if a team makes three-point shots, it will win. Memphis missed 16 of its 22 attempts from long range, but held on for the victory as the Colonials were even uglier from beyond the arc (2 for 12). The Tigers shot 49 percent for the game compared with 45 percent for 9th-seeded George Washington. Memphis had 19 assists against 12 turnovers. Austin Nichols and Shaq Goodwin were efficient inside for the Tigers, combining to hit seven of 10 shots and pull down 11 rebounds. The win means Memphis will not lose consecutive games all season. It will also give the Tigers a chance for what would be the biggest NCAA tournament upset in the program's history. UVA went 16-2 in the mighty Atlantic Coast Conference this season, winning the hallowed league's regular-season and tournament titles. The Cavaliers' frenetic motion offense is sure to test a Tiger team that goes only eight deep in its rotation. The 2013-14 Tigers have handled the role of underdog well, against Oklahoma State in the Old Spice Classic, and twice against the reigning national champions. They'll need another big upset to reach the program's first Sweet 16 since 2009. Anyone who saw as many as five minutes of the Memphis Tigers’ game in last week’s American Athletic Conference quarterfinals would have a hard time envisioning the team winning a game, let alone two, when the NCAA tournament gets underway this week in Raleigh (site of the Tigers’ sub-regional). In losing to Connecticut for a third time in three months, the Tigers looked worse than the 19-point margin of defeat suggested. No member of the Memphis eight-man rotation could claim to have played above average. Coach Josh Pastner and senior guard Geron Johnson used the words “embarrassed” and “disgusted” in facing the media after the game finally ended. They looked as beaten emotionally as they had been physically. Last Thursday was a late, sleepless night for much of Tiger Nation. 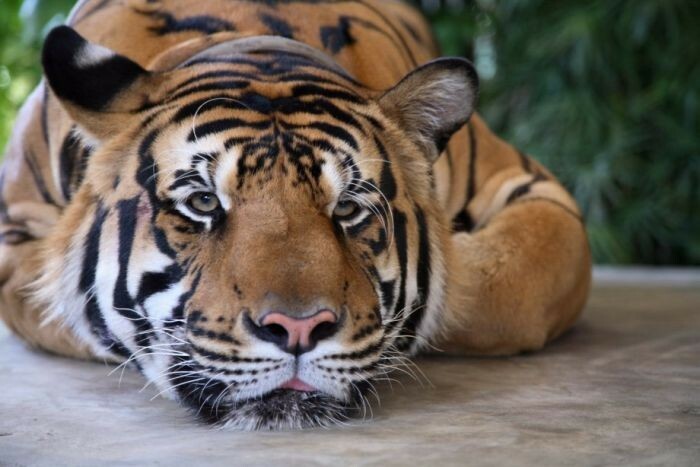 I’ve been asked since last fall if the Tiger season would be judged a failure if it ends short of the Sweet 16. Failure is a hard — and permanent — word. There are more than 200 Division 1 programs that would consider a single game in the Big Dance a successful season. (Ask the SMU Mustangs.) So if the Tigers can’t win two games . . . failure? 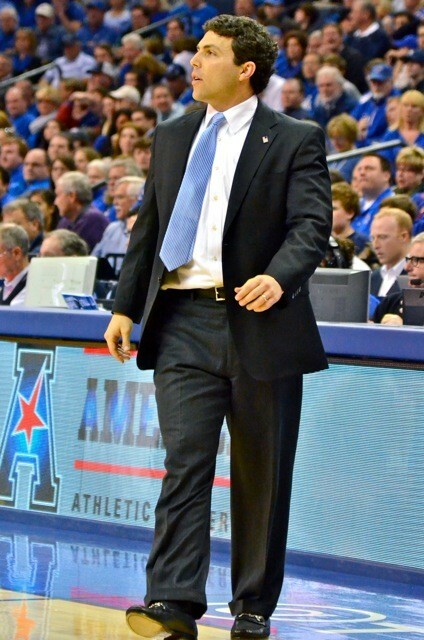 • Josh Pastner’s sunny disposition. If the Tigers lose their opening game (or even a second game, in the tournament’s “third round”), we’ll hear a lot about a fifth-straight 20-win season, and winning five games against ranked teams (including two against the defending national champs). But pulling back, examining the larger picture, we’ll see a five-year stretch of Tiger basketball with but one (or two) NCAA tournament victories. Short memories will forget the Tigers went ten seasons with but a single win in the Big Dance, from the 1995-96 campaign through John Calipari’s fifth as coach (2004-05). Those short memories remain heavy with images of four straight trips to the Sweet 16 (2006-09), a standard Pastner will be measured against as long as he keeps his current job. Lose this weekend and the season may or may not be a failure. 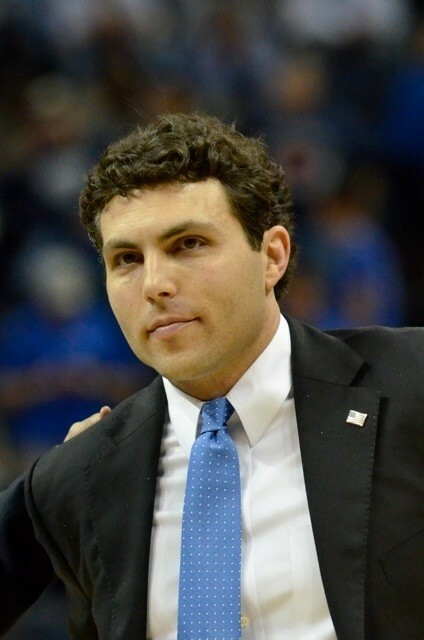 But it will begin the longest, most trying offseason of Josh Pastner’s still-young career. • Chris Crawford’s reputation. The senior guard has been an electric part of many Tiger wins. Only four Memphis players have hit more than Crawford’s 238 three-pointers. The Tigers don’t come back to beat SMU on March 8th without a three-shot flurry from downtown by Crawford. 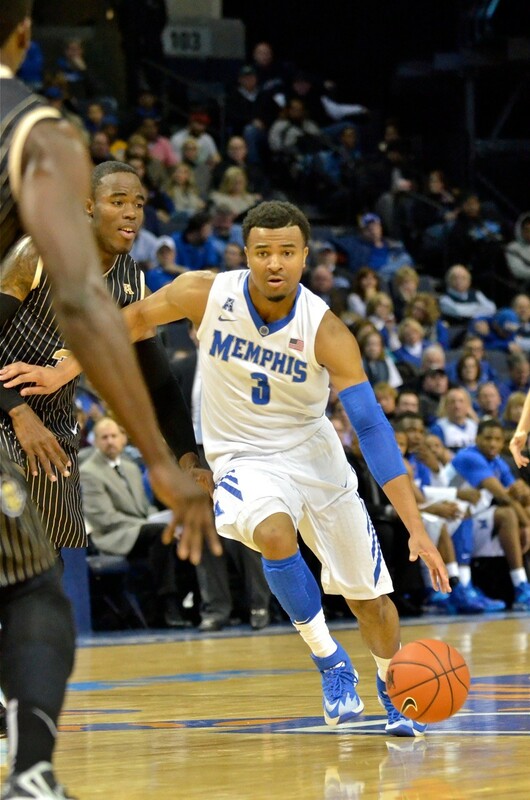 He and Joe Jackson will be just the sixth and seventh Tigers to play in four NCAA tournaments. But Crawford has been positively dreadful in his four tournament games (three of them losses). He’s taken a total of 32 shots and made six. He’s three for 19 from three-point range in NCAA tournament play. Crawford’s shooting can swing games, one way or the other. Perhaps he’s due for a positive swing. • Joe Jackson’s legacy. Not every player leaves a legacy, but Joe Jackson will. This doesn’t mean the legacy will bring smiles. Good college players reach the NCAA tournament, as Jackson has four times now. Great players, of course, play on the second weekend (at least). Whether or not he embraced it, Jackson has been the face of this franchise for a while now. In ice cream terms, the Jackson years have been a swirl of revelry and disappointment. Upsetting a number-one seed in the Big Dance would change that. • Faith in progress. In 2011, the Tigers qualified for the Dance only by virtue of winning the Conference USA tournament. In 2012, they were beaten in their first game, then in 2013, their second. The next step toward a shining moment would be the Sweet 16. Falling short of that would mean progress — on paper — has been stunted. Worse, the perception of progress would take a profound hit. Devoted fans would have to turn toward the likes of Markel Crawford, Pookie Powell, and Dominic Magee, wondering if the next group of players might be the one to return the Tiger program to national prominence. Memphis fans must hope there are two versions of the current team. The one that went 0-5 against Cincinnati and Connecticut was on display last Thursday in all its horrific colors. Perhaps the one that went 23-4 against everyone else — a team that split with three opponents and dropped a narrow loss to top-ranked Florida — will show up to face George Washington Friday night. Only one of these versions will take a place in Tiger history. The University of Memphis will dance again. Having lost decisively in the American Athletic Conference tournament quarterfinals last Thursday, the Tigers will aim to erase the sting next Friday in Raleigh, North Carolina. Memphis (23-9) was given the eighth seed in the East region of the NCAA tournament and will face 9th-seeded George Washington (24-8) in a second-round game. (Four opening-round games will be played Tuesday night.) 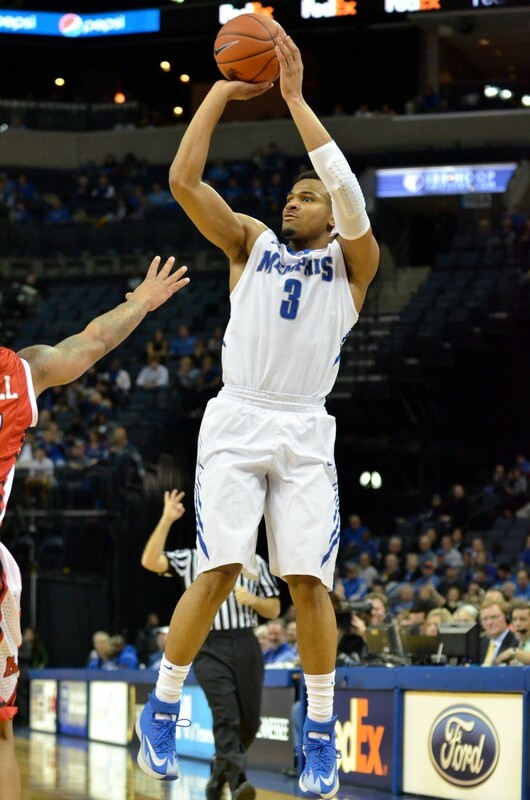 Memphis senior forward David Pellom transferred to the U of M from George Washington before the 2013-14 season. Should the Tigers survive the Colonials, they'll likely play top-seeded Virginia in the third round on Sunday. The Cavaliers open play Friday against Coastal Carolina. Since the tournament expanded to 64 teams in 1985, no 16-seed has defeated a number-one. Along with Virginia (28-6), the other top seeds are Florida (32-2) in the South, Arizona (30-4) in the West, and Wichita State (34-0) in the Midwest. Three other teams from the AAC qualified for the tournament. Louisville is the fourth seed in the Midwest, Cincinnati is the fifth seed in the East, and Connecticut is the seventh seed in the East. SMU did not make the field after being upset by Houston in the quarterfinals of the AAC tourney in Memphis. This marks the second time in three seasons the Tigers have been seeded eighth for the Big Dance. In 2012, they lost to Saint Louis in their opening game. The lowest Memphis has been seeded before reaching the Sweet 16 is sixth (1984, 1992, and 1995). More tomorrow on the Tigers' prospects in their fourth NCAA tournament appearance under coach Josh Pastner. "I did not see this one coming. We had a great week of practice. Guys were ready to play; fired up. In the first half, and really the majority of the game, we played not to lose, instead of playing to win. We played timid. It's just one of those things." Memphis coach Josh Pastner looked beaten in addressing the media following Thursday night's drubbing at the hands of the UConn Huskies. Having lost twice to the Huskies already, he should have at least seen a formidable challenge staring his Tigers down as the American Athletic Conference tournament gained steam. The beating was as thorough as any of the nine Memphis has taken this season. For all intents and purposes, the game ended when UConn forward Niels Giffey drained his fifth three-pointer of the game to give his Huskies a 51-33 lead with just under 16 minutes to play. (Connecticut outscored Memphis 21-20 the rest of the way.) With the win UConn becomes the first team to beat the Tigers three times in the same season since Cincinnati beat Memphis four times during the 1991-92 campaign. And for the first time in seven conference tournaments held at FedExForum, the host team will not play in the championship game. 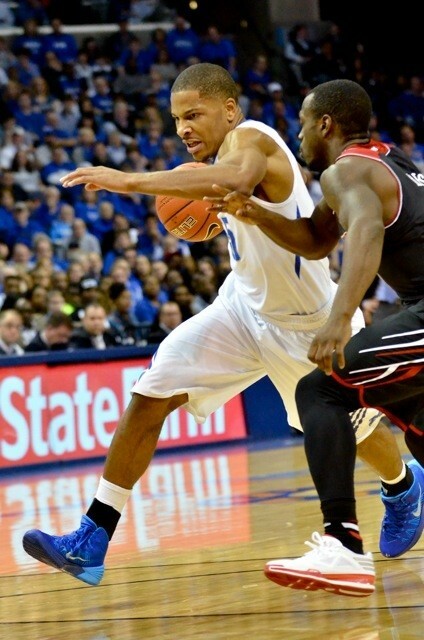 • In the first half, Memphis made six field goals and turned the ball over eight times. • The Tigers trailed by 12 just 13 minutes into the game and by 14 at halftime. • The four senior guards Pastner has leaned so heavily upon — Joe Jackson, Chris Crawford, Geron Johnson, and Michael Dixon — combined to miss 28 of 38 shots and handed out a total of three assists. • The Tigers' two major award winners — Sixth Man Dixon and Rookie of the Year Austin Nichols — were a combined 0 for 10 from the field. • The Tigers' two big men — Nichols and Shaq Goodwin — combined to take only six shots. Goodwin made one. • Memphis took 24 more free throws (37-13) than did UConn. Had they made all 17 that they missed, they still would have lost the game by two points. What is it the Huskies have on the Tigers? Ask the American's Player of the Year, Husky guard Shabazz Napier (a pedestrian 11 points Thursday night): "It's the way Memphis plays defense," he said. "They double-team on a lot of pick-and-rolls, and that leaves guys like Niels open. And we have some great shooters on our squad. If you give them time to shoot the ball, you see what happens." Geron Johnson hits a wall. The 19th-ranked Tigers (23-9) are left to ponder how low their seeding for the NCAA tournament will drop, their record now 5-5 this season against ranked opponents. 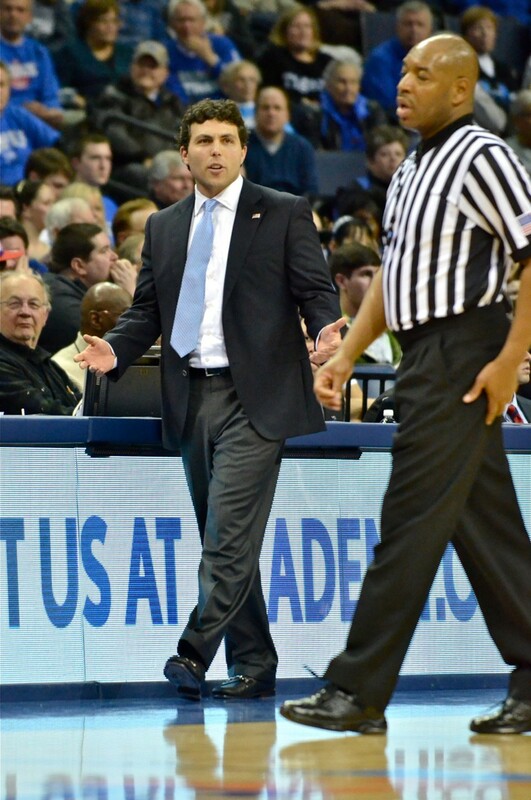 "There were breakdowns in a lot of areas," said Pastner. "They're a great three-point shooting team. Any loss needs to be put on my shoulders." Pastner insisted his team's goal remains to win not one, but two games next week when the NCAA tournament gets underway. Two victories would return Memphis to the Sweet 16 for the first time in five years. "We have to hold ourselves accountable to make shots," said Johnson. "We've got to get back to the drawing board. No one's gonna give us any sympathy. I'm disgusted with myself. I know we're better than that. The country knows we're better than that." What a difference a league makes. For the seventh time since 2005, the University of Memphis will host a conference tournament at FedExForum. But for the first time in nine years, the Tigers will not be playing the role of Cosmo Kramer in a dojo full of middle-school karate students. The American Athletic Conference, let it be said one last time, is not Conference USA. In winning the last five C-USA tournaments in Memphis, the Tigers won all 15 games they played, the closest margin of any contest being a 10-point victory over Tulane in the 2009 quarterfinals. Memphis won those five championship games by the following point totals: 11, 12, 26, 25, 26. It’s highly unlikely the 2014 Tigers win this week’s championship game by 11 points. But you can take this to Tunica: they won’t win it by 26. The best way to contrast a C-USA tournament with this week’s AAC event is the tip-off times for the respective title tilts. Fans had to be in their seats at 10 a.m. to see the Tigers whip Tulsa in consecutive years (2008 and ’09), not exactly prime time by the standards of CBS and its viewership. This Saturday’s championship will be televised by ESPN, and will tip off at 5 p.m. locally, 6 p.m. in the center of the American media universe. Best of all, ironically, may be the fact that Memphis will be an underdog in every game it plays. First Connecticut this Thursday night (8 p.m.), then presumably Cincinnati in the semifinals if the Tigers can beat the Huskies. The U of M, of course, is 0-4 this season against those two teams. Win those two and the reward could be epic: Louisville. The Tigers last played the Cardinals for a tournament title in 2005, “the Darius Washington Game” at FEF. Memories are there to be made. Unlike the C-USA era in these parts, they’ll be rigorous in the making. 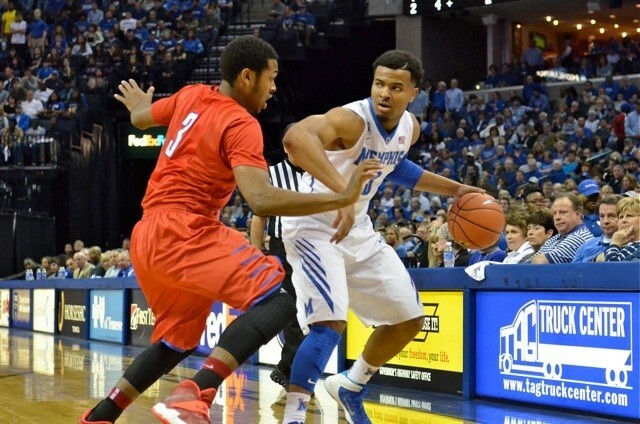 • It seems unlikely the Tigers will place a player on the AAC’s all-conference first team. It would be only the second time in the last nine years Memphis hasn’t had a player so recognized. (Once again, this ain’t C-USA.) There are three locks for the team, all of them guards: Louisville’s Russ Smith, Cincinnati’s Sean Kilpatrick, and UConn’s Shabazz Napier. Among forwards, UCF’s Isaiah Sykes (16.4 points and 7.1 rebounds per game) and Houston’s TaShawn Thomas (15.5 and 8.0) would seem to have an edge on Tiger sophomore Shaq Goodwin (11.9 and 6.6). Memphis has leading candidates, though, for both the league’s Rookie of the Year (Austin Nichols) and Sixth Man Award (Michael Dixon). UPDATE: Goodwin and Joe Jackson were named to the AAC's all-conference second-team Tuesday. The first team: Smith, Kilpatrick, Napier, Louisville's Montrezl Harrell, and SMU's Nic Moore. On Wednesday, Nichols was named ROY and Dixon received the Sixth Man Award. • Aside from two fan bases, anyone associated with the AAC — particularly commissioner Mike Aresco — has two teams they don’t want to see raising a trophy Saturday night: Rutgers (no worries there) and Louisville. As if Memphis fans needed another reason to grind teeth over the Cardinals, the sight of Rick Pitino’s club leaving for the Atlantic Coast Conference with the first AAC tournament championship might induce dry heaves. The Big Ten can have the Scarlet Knights. Hate Louisville all you want, but the AAC will be diminished without the Cardinals. • Why isn’t there a banner at FedExForum honoring the Memphis teams that won tournament championships? These are significant — they still bring an automatic NCAA tournament berth — but seem lost to history among all the NCAA tournament and NIT banners. I suggest a single banner, with the years the Tigers raised a trophy. (They won the 1929 Mississippi Valley Conference tourney, then four Metro titles and seven C-USA championships.) These would seem to be happier reminders of a proud program’s history than, say, back-to-back appearances in the 1990 and 1991 NIT. Ask Elliot Perry what he thinks of those banners. Joe Jackson and Chris Crawford have played 136 games together as college teammates, which explains the loud and lengthy standing ovation each received in today's pregame Senior Day ceremony. Trouble is, the two native sons played the first half against 18th-ranked SMU like the emotions of the salute hampered their skills. But second halves count, too. Jackson drilled a three-pointer from near the top of the arc — only his second trey in seven games — to give the Tigers a 33-30 lead just 45 seconds after the break. The field goal (Jackson's second of the contest) finished a 7-0 Memphis run that erased the 30-26 lead SMU held at halftime. Another Jackson three-pointer with 14 minutes to play regained the lead for the U of M (41-39), and helped spur a 20-7 run during which every point came courtesy of a Tiger senior. Having missed all four of his shots in the first half, Crawford ignited from outside with a three-pointer from the left corner that extended the Memphis lead to 50-41 with 10:50 to play. The pride of Sheffield High School hit two more treys over the next two minutes, stretching the Tiger advantage to 12 points, enough to weather a pair of late Mustang runs and clinch the home team's 23rd win of the season. "I'm an emotional guy, and it got to me a little bit," said Crawford after the game, acknowledging the weight of his Senior Day moment. "I've been here for some struggles, and a lot of great memories. What's most important, we got the win. I'm a shooter, and my coaches and teammates have a lot of confidence in me. They told me to keep shooting. I saw the first one go in, and we were able to gain some momentum." The teams each entered the game having lost their last contest, neither having lost two in a row all season. The win avenges a 15-point loss Memphis suffered in Dallas on February 1st and all but assures the 20th-ranked Tigers will complete the regular season having been ranked in the Top 25 every week. Each team finishes the regular season with an overall record of 23-8 and 12-6 in American Athletic Conference play. The Tigers were 5-4 against ranked opponents. "We were poor offensively in the first half," said Memphis coach Josh Pastner, alluding to the Tigers' 34-percent shooting and 0-for-6 showing from three-point range over the game's first 20 minutes. "But we defended, unlike Thursday [at Cincinnati]. Austin Nichols and Nick King made big plays to allow us to stay close." Nichols scored 14 points and grabbed nine rebounds, while fellow-freshman King scored seven points and earned seven rebounds in 17 minutes. "Chris Crawford hit big shots," added Pastner. "Joe Jackson hit a three pointer [early in the second half] and it seemed contagious. We made threes in the second half, which allowed us to get the victory. A great win. Those senior guards really came through for us in the second half." Michael Dixon hit a short jumper, scored on a layup, and stole the ball during the Tigers' game-shifting run. Limited to 16 minutes by foul trouble, Dixon only scored nine points, ending a streak of 11 in a row with at least 10. After scoring only three points in the first half, Jackson poured in 15 in the second to lead the Tigers. His total of 18 would have been more had he not missed five of nine free throws. The Tigers shot 59 percent in the second half and hit six of 13 three-point attempts. "I was very frustrated at halftime," said Jackson. "It was a change in attitude for the second half, just be aggressive no matter what they do. Sometimes this team looks methodical out there, and I have to turn on an extra gear. In the first half, we tried to play halfcourt basketball too much; we didn't get any transition points. I told Coach we have to run, to speed up the tempo. I have the ability to do whatever I want to on the court, but sometimes I wait till it's too late. It hurt our team, because they expected me to take over early." Like Crawford, Jackson admitted an emotional impact on Senior Day. "Today was a great day to be a Tiger," he said. "It's been a long haul for me. I'm blessed for the opportunity. It was a fun atmosphere out there." "I'm so proud of our seniors," said Nichols. "The way they finished the game reflects their character. It's awesome to be on the court with them, just to have them around." The Tigers' next game will be in the quarterfinals of the American Athletic Conference tournament. They'll face Connecticut next Thursday night (8 p.m.) at FedExForum. The Huskies won both games against Memphis in the regular season. The Tigers cooperated nicely with the Senior Day script tonight at Cincinnati. Departing Bearcats Sean Kilpatrick (34 points), Titus Rubles (24), and Justin Jackson (13) dominated from the opening tip to lead 15th-ranked Cincinnati to a second easy win over the 20th-ranked Tigers. Memphis fell behind 18-4 over the game's first eight minutes, climbed back steadily — pulling within one (43-42) four minutes into the second half — but then yielded a 24-9 Bearcat tear over an eight-minute stretch of the second half that decided the contest. Having lost to the Bearcats by 16 at home on January 4th, the Tigers must now ponder the prospect of a third meeting next week when FedExForum hosts the American Athletic Conference Tournament. Cincinnati moves into a tie with Louisville atop the AAC with a record of 14-3, while the Tigers (22-8 overall) fall to 11-6 in league play. 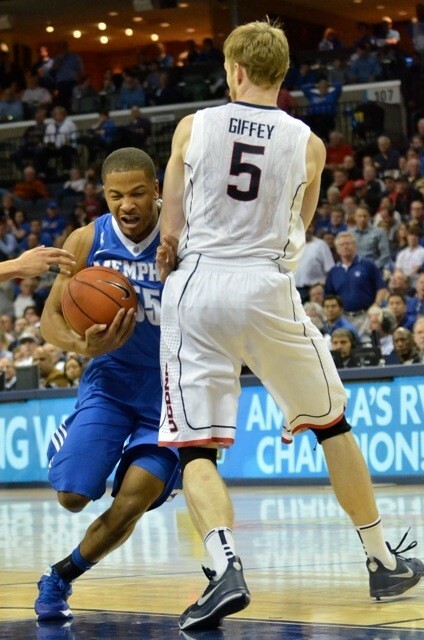 Freshman forward Austin Nichols played a stellar game for Memphis, hitting seven of 12 shots for 17 points. Senior guard Joe Jackson led the Tigers with 21 points, though most came after the game had been decided midway through the second half. The Tigers shot 47 percent for the game while Cincinnati hit 53 percent and scored its most points of the season against teams not named Chicago State. The win ends a two-game losing streak for the Bearcats. The Tigers return to FedExForum for their own Senior Day Saturday when 18th-ranked SMU comes to town. The game will be the ninth this season for Memphis against a ranked opponent, tying a program record set in the 2004-05 season. Tip-off is scheduled for 11 a.m.
2014 Memphis Tigers "Senior Salute"
So in advance of this Saturday’s Senior Day — honoring six(!) Memphis players before the Tigers face SMU — I’ll share precisely what I’ll miss the most about each member of this team’s senior class. • I’ll miss the family tie that is Trey Draper. No ordinary walk-on, Draper is the son of Wanda and Leonard Draper. And Leonard Draper was among the late, great Larry Finch’s dearest friends. The undersized graduate of Mitchell High School connects this team to the program’s preeminent figure in a way few Memphis teams can. Draper happened to score the Tigers’ 100th point in two wins this season (over LeMoyne-Owen and Rutgers). He earned the cheers that followed. • I’ll miss David Pellom just being there. (Let me explain.) The graduate transfer from George Washington has had no double-doubles or game-winning shots. He’s no all-conference candidate. And there will be loyal Tiger fans who have trouble coming up with his name five years from now. But Pellom has been there — on the offensive end and defensive — countless times this season when it seemed the Tigers needed a booster. A putback after an offensive rebound. Drawing an offensive foul. A rebound in a crowd of opponents. Pellom has battled knee discomfort all season, limiting the impact he might have made. But let’s not discount the impact he has made . . . and could yet make in the postseason. • I’ll miss Michael Dixon’s bravado. After the Tigers’ win over Nicholls State last November, Dixon sat down next to me after the game, pointed to Geron Johnson a few feet away, and asked, “Who’s the better interview?” I laughed at the question (and refused to answer, knowing a full season lay ahead). Dixon was having fun, even after the final buzzer, but the question revealed a slice of Dixon’s competitive nature. 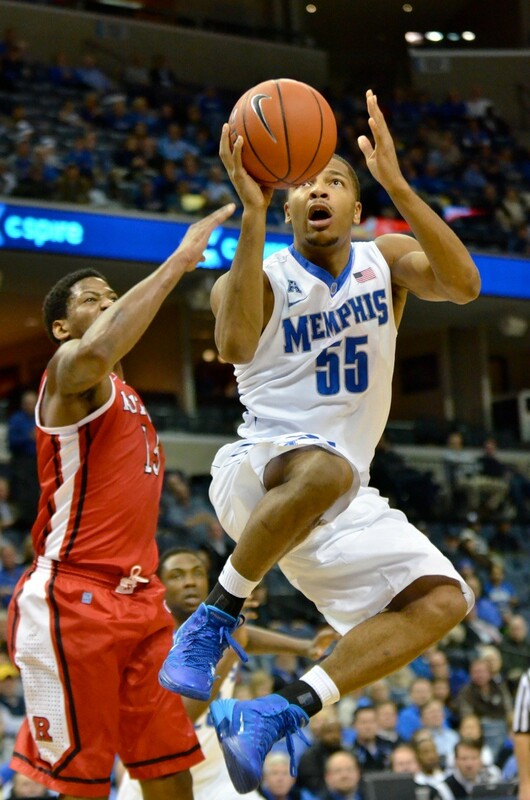 He came to Memphis after being dismissed by Missouri (amid sexual assault allegations) before the 2012-13 season. And he has seized the chance to make a positive difference coming off the bench for a relentlessly positive coach. Rare is the guard who, without starting, scores at least 10 points in 10 consecutive games. Whether launching a three-point attempt or venturing into the lane against larger men, Dixon has personified a daring element that makes this Tiger team among the most resilient in recent history. Ask the Louisville Cardinals. • I’ll miss Geron Johnson’s intensity. And I’ll miss his genial nature in the media room. Johnson arrived on the Memphis campus in 2012 with a rather ugly track record, having been dismissed from two junior college programs (after being charged with attempted burglary in high school). But since the day he first met with Memphis media, Johnson has stuck to a simple, yet profound mantra: That was then; we can only control the future. He’s been a critical component in the Tiger rotation for two seasons now, and without incident off the floor. Arguably the best natural athlete here since Derrick Rose, Johnson was electric in the Tigers’ loss at UConn last month. Were it not for Shabazz Napier’s late-game heroics, Johnson’s coast-to-coast drives would have carried highlights of that contest. And he’s been a model, really, for how to handle the media spotlight in a city where basketball players are celebrities before they make their first shot. Every win, according to Johnson, is a big win. Nothing should be taken for granted in basketball. Put a game in the win column, and move on to the next. You know what they call that kind of attitude, right? Professional. • I’ll miss Chris Crawford’s eyes. The pride of Sheffield, if you ask me, is the best passer the Tiger program has seen since Penny Hardaway. When kids begin playing basketball, the first skill they’re taught is dribbling with their head up. But it’s one thing to look up as you dribble, quite another to see the entire floor as the likes of Magic Johnson, Penny Hardaway, and yes, Chris Crawford can. Crawford has some significant career numbers. He’s the only Tiger with 200 steals and 200 three-pointers. He’s ninth in school history with 454 assists. And the numbers Crawford put up in the 2013 Conference USA tournament — 77 points, 19 treys in three games — are already a part of Tiger lore. But that vision, those eyes. Rare indeed. Crawford and Joe Jackson are aiming to become just the sixth and seventh Tigers to play in four NCAA tournaments. • I’ll miss Joe Jackson . . . being Joe Jackson. His was a challenge similar to that of Larry Finch, Elliot Perry, and Penny Hardaway: a local high school star who chose to be a Tiger in front of family and friends (the latter numbering in the thousands and growing with every basket Jackson made). But with the hometown adulation came acute pain when criticism was slung. Again, that family-and-friends factor. (A stranger can call me what he chooses, but when a “friend” says I can’t lead my team . . . .) Consider this a teaser, as Jackson will be the subject of our cover story in the March 13th print edition. I’ll finish with a quote from a longtime Memphis basketball observer, his identity to be revealed in that cover story. A cocktail of desperation and determination can do wonders for a college basketball team. 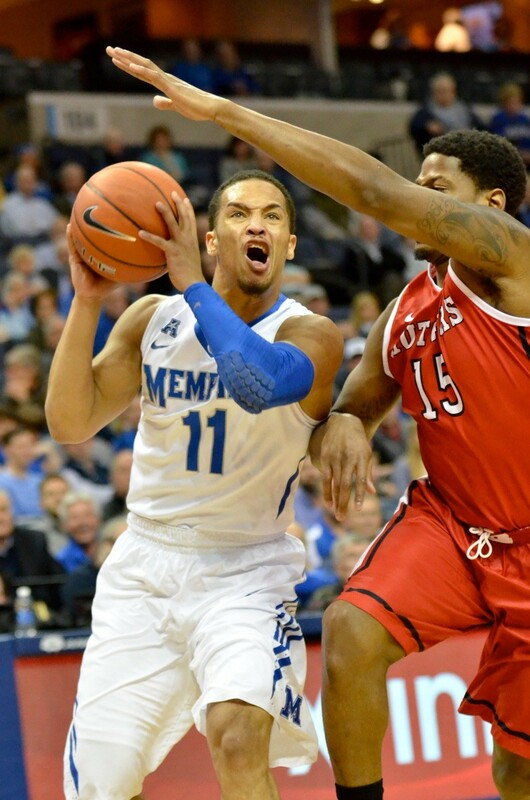 Less than 48 hours after their most deflating loss of the season, the Memphis Tigers reeled off an impossibly improbable 15-1 run to end this afternoon's nationally televised game and beat their arch-rivals from Louisville for the second time in less than two months. The victory gives Memphis its first season sweep of the Cardinals since Larry Finch's last season as head coach (1996-97). As the fates would have it, it's the second such sweep by Memphis when the Cardinals were the reigning national champions, as the Tigers beat Louisville three times (including in the Metro Conference tournament) in the 1986-87 campaign. "We're a veteran team," emphasized Chris Crawford, one of the Tigers' late-game heroes with a three-pointer from the top of the arc that gave Memphis a 68-65 lead with 1:36 to play. "We're going to stay poised regardless of the situation. We've been through a lot. Basketball's a game of runs, and we made the last run to come away with the win." The Tigers led the entire first half despite 15 points from Louisville's star guard, Russ Smith. Memphis scored the game's first six points and led by as many as seven (27-20) before settling for a 36-31 lead at the break. But the Cardinals — who entered the contest on a seven-game winning streak — went on a 13-4 run over the first five minutes of the second half. Sophomore forward Montrezl Harrell was a man among boys for Louisville, throwing down three alley-oop dunks, one from such heights that the new banner honoring Tiger great Larry Kenon seemed to flutter in the rafters of FedExForum. Harrell's slam following an offensive rebound with 4:44 to play gave the visitors a 65-57 lead. A driving layup under pressure by Tiger guard Michael Dixon closed the gap to 65-63 with 3:15 left, then Geron Johnson stripped Smith of the ball and drove to the rim for his own layup to tie the score. Crawford connected for his fourth three-pointer of the game and the Tigers hit four of six free throws over the game's last 63 seconds to seal the biggest home win of Tiger coach Josh Pastner's career. 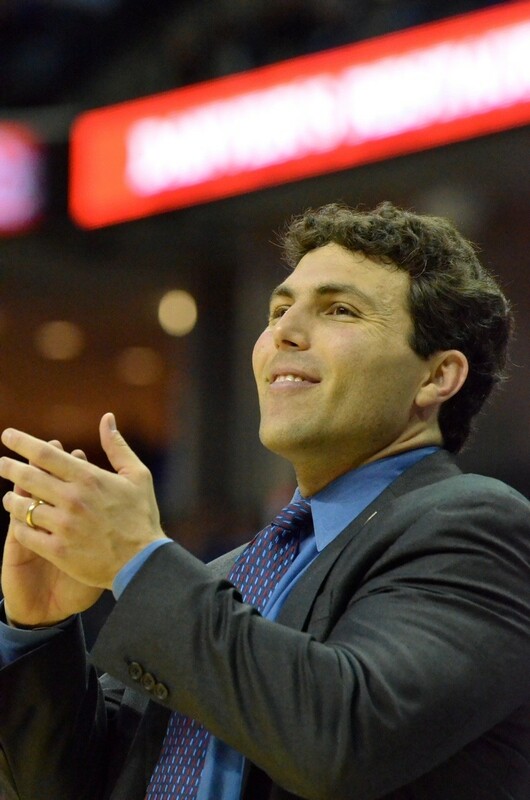 "It was six-on-five because of our fan base," said Pastner. "They were so loud. That was a big-time win, a great bounce-back win against a great team. I didn't sleep until last night [after Thursday's loss at Houston]. There's no better time to hug a win than today." 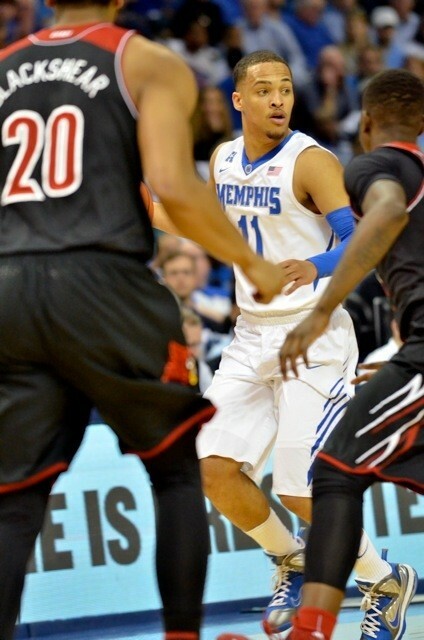 Memphis hit six of nine three-point attempts while the Cardinals misfired on 19 of 23 shots from behind the arc. And the Tigers won despite getting virtually no offensive production from senior guard Joe Jackson (one for seven from the field) and sophomore forward Shaq Goodwin (one for eleven). Dixon led the U of M with 18 points, his 10th straight game with at least 10 on the scoreboard. Johnson added 15, Crawford 12, and freshman forward Austin Nichols scored 14. Tasked with battling the fearsome Harrell most of the game, Goodwin did pull down 10 rebounds and added four steals and three blocks. "It's a big win for the city," said Crawford. "We played as a unit. That's definitely one of the biggest threes of my career. I had to knock it down for my teammates." "We stayed the course," said Dixon. "It paid off. We've got a lot of good players, and a lot of them stepped up today. Louisville's a good team; we were just better today. I have the utmost faith in this team. We have a lot of resiliency. When Chris hit that three, I've never heard a place that loud. And I've played in some big-time arenas. Coach and Chris had a real heart-to-heart after the Houston game. Stay confident." The loss drops the 7th-ranked Cardinals to 24-5 on the season (13-3 in the American Athletic Conference), while the 21st-ranked Tigers improve to 22-7 (11-5). Memphis holds out hope of gaining the coveted third seed in the AAC tournament, to be played at FedExForum March 12-15. With Louisville departing for the Atlantic Coast Conference next season, a potential third game between these two longtime foes (today was their 89th meeting) would carry extra weight. For now, the Tigers will relish a win over one of their league's heavyweights, while turning their attention toward a rematch with the 11th-ranked Cincinnati Bearcats next Thursday in Ohio. The plan moving forward? Says Johnson, "Stay humble and determined."